Please give Birch a home! My name is Birch. I come from a family of seven. 2 of my sisters and 1 of my brothers were adopted into loving homes and 1 of my brothers went missing. That left 3 of us, me, Lily and Oak. A kind lady took care of us. We grew up in a tomb site. We had warm blankets, shelter and food to eat. We were regularly de-flea and kept healthy. As we got older we started to stray from the tomb. Our carer was worried about us, but we always came running at feeding time and stayed close to our mother. Then just before Chinese New Year we went missing. Our carer found two dead bodies and thought one of them was me. They were too deteriorated to see clearly. She was so upset but never gave up looking for my brother and sister. However, I wasn’t dead. I’d been caught in one of those nasty Jin traps and I was scared of all the fire works. Today February 28th I appeared. My carer was taking her dogs for a walk and saw me. As soon as she called my name I came running. I’m missing half of my front leg now and I’m very hungry and dehydrated. My carer has taken me to her home and that is where I’ll stay until I find a permanent home. I’ve had quite an exciting life up to now and I’m only 6 month old. I will have an operation on my leg on Tuesday and will be nursed back to health by my foster mom. Then I’ll be ready for adoption. Updating news about Kiki and Sparky: two little kittens. Kiki and Sparky have improved so much since they were first rescued. 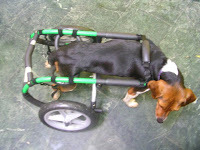 Skal's new wheelchair is here! After 20 minutes in her wheelchair, Skal is already very comfortable! 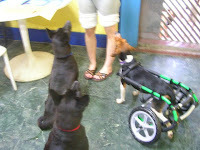 Skal, along with Judy and Julian, is waiting for snacks. please contact Lilian Lim at lilian@animalstaiwan.org. All proceeds of the flea market goes towards helping the strays of Taiwan. Music play " Happy Times" from March 11 to March 20. The roadshow will perform without any entry fee. It will be a present for my lovely dog, Bobo Thank you for teaching what genuine dedication is, learning to cherish my love, learning to face the challenge bravely and learning to satisfied with my life. This play brings you into the story between the little girl and her lovely pet, Popo. Please enter 15 minutes earlier before the play starts.